You know what guys? Fingerling potatoes look a lot like . . . fingers. Just saying. And not in the like, “That’s awesome!” kind of way. More in the, “Well that’s odd,” kind of way. 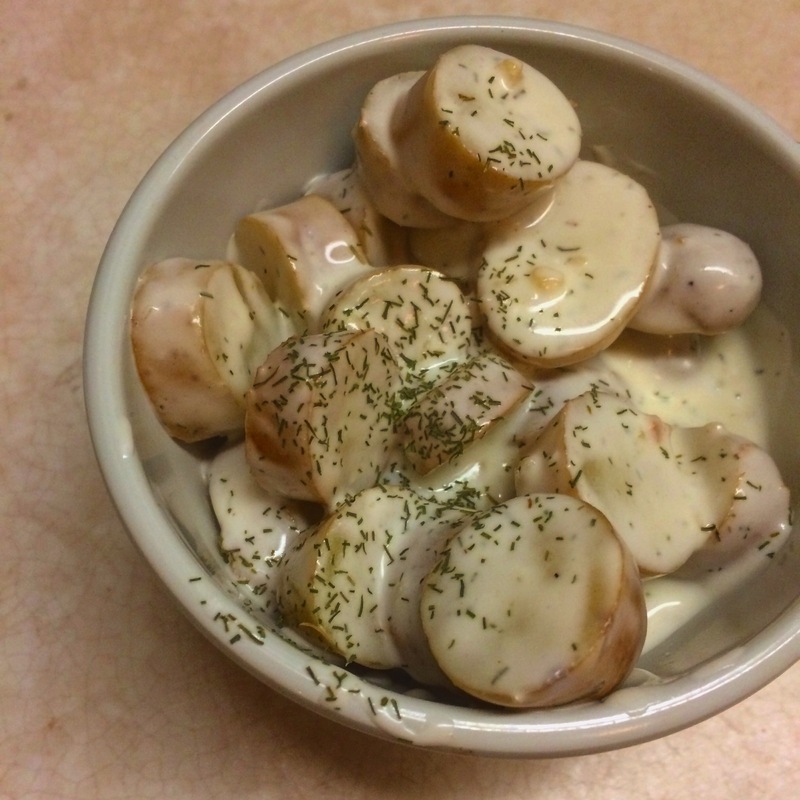 Now that that’s out of the way, on to this most delicious recipe, staring: fingerling potatoes. Is that gross? I don’t know. Sorry, not sorry. Because this really is delicious. Reminiscent of summer picnics and everything cool and refreshing. Or, if you’re like me, a prefect late-night snack! Or if you prefer, a potato side dish that delights rather than bores. slice the potatoes in rounds—about 1/2 inch in width. I love these little potatoes because just a few slices and you have the most perfectly-sized bites imaginable. Cover with cold water and a dash of salt in a medium cooking pot, and bring to boil on med-high heat. Boil for 10 minutes or so—until fork tender but not falling apart. These little potato bites will need to hold their own in the dilly mayo sauce they’re about to be slathered in. In a bowl, blend 1 cup homemade mayo, (this is truly the easiest thing in the world to make and SO good, but if you’re intimidated, go ahead and use whatever remade mayo strikes your fancy), salt, pepper, dill weed, ground mustard, sugar, and diced garlic together until well combined. Add vinegar, lemon juice and greek yogurt, and whisk until smooth and all ingredients are fully incorporated. Spoon over cooled potatoes in generous amounts. No holding back here. You’re going to want to pour it all on. Yes. Go ahead. All of it. The sauce makes these guys sing. Serve as a chilled side to grilled chicken, brats, or my favorite: salmon.